Plant for the Planet program could be used within a classroom to inspire students to make changes by witnessing what other students are doing around the world. Oftentimes individuals don't know what to do to help make a difference. Teachers could utilize this video in a motivational context or as an example of ways in which individuals can make a difference in organizing community projects. 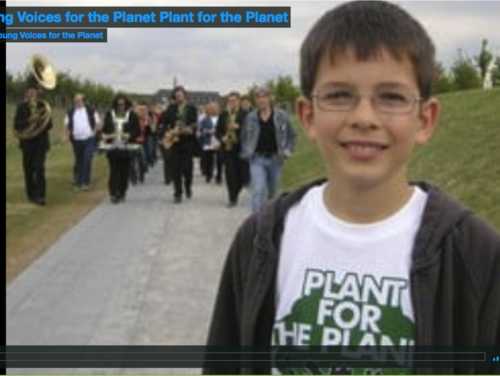 Through this video, students can witness other students making a difference and actively addressing climate issues. Planting trees may or may not be an effective carbon sequestration strategy - science seems to be changing on this. Talks about "climate justice" - the idea that each person on the planet only has the "right" to pollute the Earth with 2 tons of CO2 each year. Briefly brings in data that highlights current US and European CO2 emissions annually, which is far above the 2 tons cited. Presents the idea that every person is responsible for contributing to climate change, some more than others. Demonstrates that there are solutions to climate change and "children can do something." A link to Felix's foundation is provided. Videos are easily used in classrooms.